— Massachusetts officially joined the State Authorization Reciprocity Agreement in mid-June. This interstate educational agreement makes it easier for colleges and universities to offer online courses outside of their home states. Massachusetts students interested in online education will benefit as a result. Thanks to SARA, Husson University’s courses are now recognized in 49 states and Puerto Rico. California and the Marshall Islands are the only two areas that do not participate in SARA. Accredited by the New England Association of Colleges and Schools (NEASC), Husson University holds the highest level of accreditation available. Online courses from non-profit Husson meet stringent educational standards. In addition to providing students with a high-quality education, Husson University prides itself on its efforts to keep college affordable. The University is the lowest net-priced, private four-year college in Northern New England accredited by NEASC. Husson attained this distinction through a combination of low tuition and low fees. “The net-price students pay needs to take both tuition and fees into account, along with financial aid. Colleges with low tuition may appear to be a bargain at first, but if they have numerous fees or expensive fees, cost savings can quickly evaporate. At Husson, we strive for transparency. All of our fees and tuition are clearly spelled out to our students,” noted Haus. Another way Husson keeps education affordable is through transfer credits. Online students who have completed courses at other colleges and universities will find that Husson has a generous transfer policy and accepts credits from various accredited institutions and/or programs. The more transfer credits a student receives, the fewer courses he or she will need to complete a degree. Another unique aspect of online courses at Husson is their student-centric nature. On campus and online classes average a mere 20 students. As a result, online Husson University students get just as much personalized attention as students who take courses in a traditional classroom setting. These degrees are suitable for anyone interested in advancing their career to the next level through education. Traditional and non-traditional students can both participate in online courses. Geography does not affect participation. 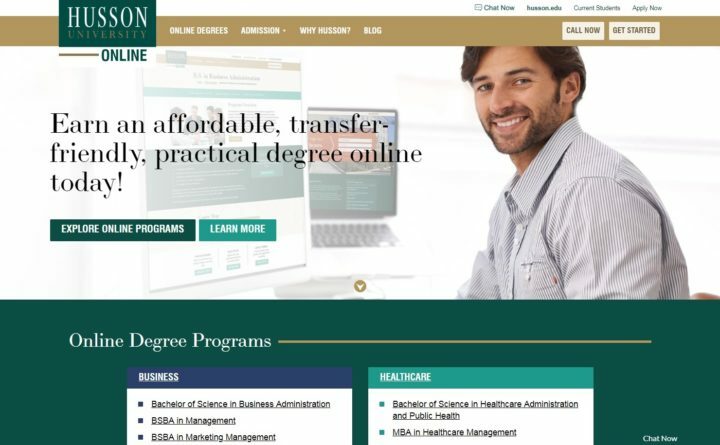 Students from coast-to-coast can take online classes from Husson University. Online students can also structure their studies in ways that make sense for their unique life circumstances. A course can be completed over the course of 14 weeks or students can opt for a seven-week accelerated course offering. At Husson, online students have access to a variety of services that are usually only available to traditional students. For example, online students can work with our Career Services department to help secure internships and job placements, the same way our on campus students do. In addition, after graduation, online students are welcome to attend Homecoming and other alumni activities as full-fledged members of our Alumni Association. The University is committed to consistently making opportunities available to all students, regardless of the way they take courses. For more than 100 years, Husson University has prepared future leaders to handle the challenges of tomorrow through innovative undergraduate and graduate degrees. Many members of the Board of Trustees were, at one time, students who attended Husson University. With a commitment to delivering affordable classroom, online and experiential learning opportunities, Husson University has come to represent superior value in higher education. Our Bangor campus and off-campus satellite education centers in Southern Maine, Wells and Northern Maine provide advanced knowledge in business; health and education; pharmacy studies; science and humanities; as well as communication. In addition, Husson University has a robust adult learning program. For more information about educational opportunities that can lead to personal and professional success, visit Husson.edu.